If you are a BBQ enthusiast, then you most likely want to build an outdoor kitchen that truly reflects your passion. You want a kitchen that brings about your love for good BBQ. With most people, a kitchen may just be another ordinary thing, but with a BBQ lover, you want to show off both your ‘cue skills and your creative aspect then you need a BBQ Smoker centered outdoor kitchen. However, where do you even start? 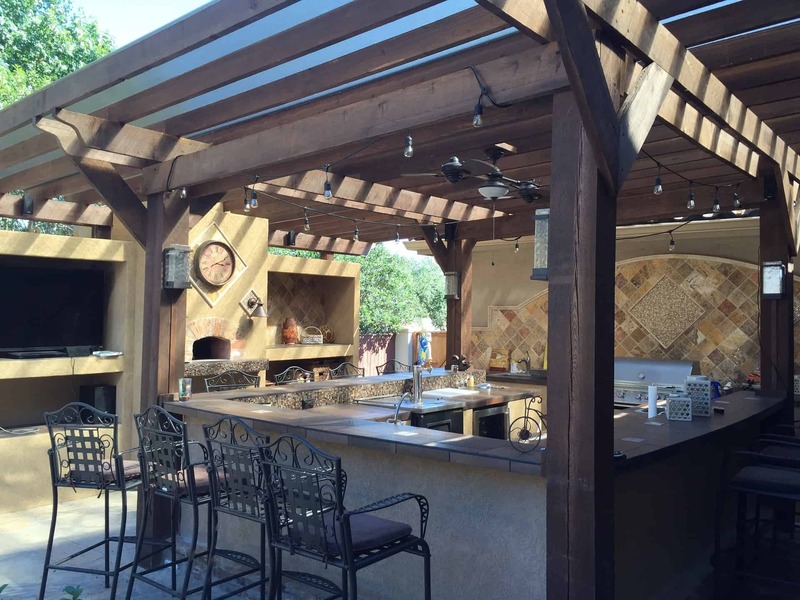 Where do you get the ideas to pull off an amazing outdoor Kitchen design? Well worry not, this article is here to help you get the ideas and by extension, the push you need. However, before we jump into that, there are a few things that you probably need to ask yourself with the most notable ones being; do I have the financial capabilities to pull it off? Will this design blend well with my backyard? Will the outdoor kitchen fit in my backyard? Well if you can answer those questions, then you probably have a go with the following designs here. Additionally, you need to find out if there are smokers that will fit in with your design. BBQ Smokers are probably the most important aspect of these designs. It is very easy to build any outdoor kitchen that you want, but to build one around a smoker is another thing altogether. For starters, you need to find out the best smoker to buy and then build from there. So, how do you choose the best ‘cue smoker for your outdoor kitchen. Royal Gourmet has been known to produce excellent grills and smokers, and it is no different with this one. The 26″ Barrel charcoal grill with a smoker is primarily made up of steel and users can expect a durable grill. The equipment has a total cooking space of about 800 sq. in. which is divided into three. The first is the warming rack that is plated with chrome, and it covers about 179 sq. in. and then there is 438 sq. in. of wiring grates that are coated with porcelain. Last but not least is the offset smoker which takes about one hundred and eighty-three. The manufacturer has done a great job combining both the grill and the offset smoker giving the grill great heat and smoke circulation and users have an easy time with it. So as to add charcoal easily, the equipment has been fitted with a door, and there is also a side door for easier cleaning. There is a built-in thermometer that will help you track the internal heat. So as to protect your hands from high temperatures, the manufacturer has built in a spring handle. Furthermore, if you want to stoke the fire, you can open the stack and open the air vent on the chamber which also makes it easy to control both the fire and smoke. comes with a cover to help protect it. For easier movement, the grill comes with two wheels which makes it convenient for an outdoor kitchen. It is also not that big, and its compatibility and versatility make it easy to use on your patio, balconies or backyard for a good BBQ session. Do you love showing off your BBQ skills? 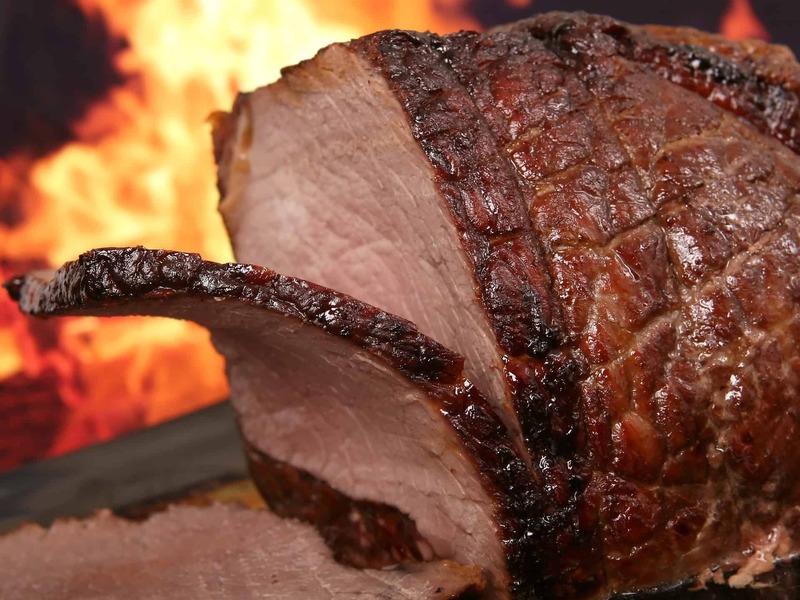 Do you enjoy grill and smoking some very sweet and succulent food? Then this Offset Smoker and Grill from Oklahoma Joe’s Highland should be your next purchase. The equipment is made up of heavy gauge steel and has enough space to cook various meals at ago. The Oklahoma Joe’s Highland Offset Smoker and Charcoal Grill is your go-to equipment if you want to have a memorable outdoor BBQ. It gives you a chance to showcase your ‘cue skills with any type of steak, fish, chops, chicken or even veggies that your friends and family will remember for a long time. The manufacturer wants the users to enjoy complete control over both the heat and smoke and this is why they have built a layer of dampers together with a three-inch temperature gauge. To tend to the fire as easily as possible, the manufacturer has built an access door that makes you take care of the fire without interfering with the heat in the main chamber. There is also a clean outdoor grill that helps with ash removal and also for easier cleaning. The equipment is spacious, and it has been divided into several spaces to give you more space and convenience when cooking. The main cooking chamber takes about 619 sq. in of the total 900 sq. in. with the remaining 281 sq. in. being devoted to the firebox chambers. All the cooking space is made up of steel grates that are coated with porcelain to give users a long-lasting grill. For easier mobility, the grill is fitted with 2 wheels that makes it easy to place it anywhere you want in your backyard. For easier storage, the vendor has two shelves, one at the front and one at the back making it easy to store things. Even though the Oklahoma Joe’s Highland Offset Smoker and Charcoal Grill does not come with a cover, it is still durable and has a 2-year warranty. This piece of equipment lets you enjoy the ultimate BBQ experience. For you to set it up you will require approximately one hour which makes you guess how big it is. This piece of equipment comes with a variety of cooking options and the distribution of heat in the compact space is thorough. The Compact Charcoal Smoker and Grill comes with a cover and features two cooking grates that are coated with chrome. So as to have both smoking and grilling functionality, the product comes with a removable section at the middle. The manufacturer has included a big capacity chamber for both the charcoal and ash and this makes it super easy to maintain it. This ensures that users get an easy cooking time without having to worry about how to clean the product. 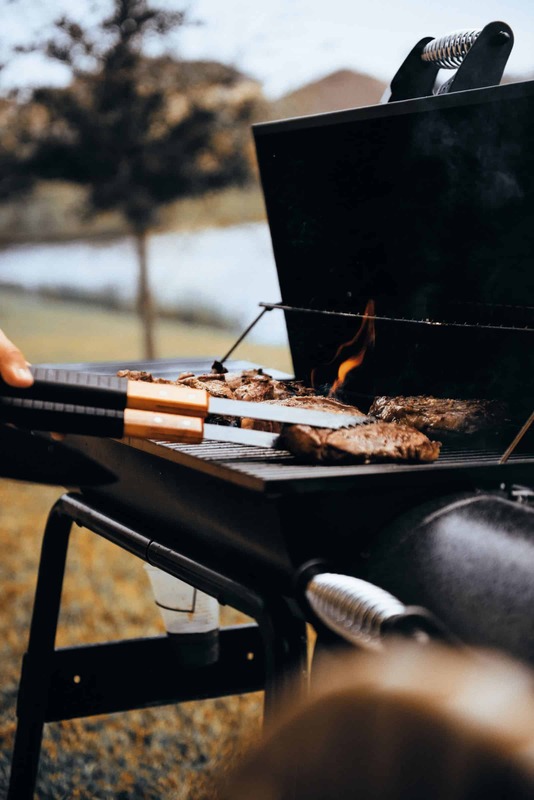 It also comes with a stainless-steel temperature indicator for both smoking and grilling and BBQ lovers will be able to gauge the temperature levels and cook using their ideal temperatures. This equipment has a side door, made of stainless steel, that can be used to access the internal chambers. There is also a lid damper that can be easily adjusted as well as 2 bottom dampers that can be used to control the temperatures while cooking as well as fine tuning the smoking flavors. It contains high capacity chambers for both charcoal and ashes. If you are a fan of Smoking and eating some freshly grilled meat, then this product is a must-have for you. Oklahoma Joe is known to produce some excellent BBQ equipment and this time is no different. The Oklahoma Joe’s Longhorn Reverse Flow Offset Smoker and Charcoal Grill is made up of heavy gauge steel so as to give customers a strong and long-lasting service. The product helps you enjoy a high level of control as it comes with several dampers and a three-inch temperature gauge. Additionally, there are removable baffles and an option to choose smokestack locations which will enable you to change the directions the smoke is flowing to as well as heat giving you a very conducive cooking environment. This kind of environment, you can get juicy and mouthwatering steaks, fish, chicken, veggies or any other type of meal that you desire. This Smoker has a total of 1060 sq. in. cooking space and is mounted on two large 10.in. wheels which make it super easy to move it anywhere you want from patios to balconies to the backyard. The fact that it is easy to move around makes it convenient for you to try out different kinds of outdoor kitchen settings without a fuse. On the other hand, the clean-out door is used when one wants to remove the ash as well as clean the interiors. In terms of space, this product comes with both front and bottom shelves that make storage easy and convenient. Even though the Oklahoma Joe’s Longhorn Reverse Flow Offset Smoker and Charcoal Grill does not have a cover, it is still a very good addition for your outdoor kitchen. The manufacturer offers a two-year warranty for the product which takes about 45 minutes to assemble. The Pit, which is made in Houston, TX, is one of a kind. If you are looking for a smoker that is fuel efficient, then this is the thing for you. The product combines both wood and charcoal and the heat control technique on this one is top notch. The exterior of this product is made up of steel for durability. So as to prevent rusting, the manufacturer uses high heat paint that’s of industrial quality. This pit has a heat plate that can be used to put water that manages temperatures and also used in charcoal grilling. For cleaning purposes, the product is fitted with easy to open door as well as a removable fire grate. There is a Pitts and Spitts thermometer installed in this smoker for an actual temperature, and they have also installed a gas assist lighter for easier, quicker and clean fire. The firebox is designed to give clean smoke and give an amazing ‘cue experience. The manufacturer had given heat and smoke control much thought, and this is why he created a stainless-steel swivel damper and a rain cap that’s on top of the smokestack, and thus users have the upper hand in heat and smoke control. The cooking space comes in the form of 2 slides out racks that makes it super easy for loading. The exterior of this smoker is made up of heavy gauge steel with 304 stainless-steel, and carbon steel is used to make the interior. After going through the above smokers, it is now time to get to know some of the very best outdoor kitchen designs. Just like any other type of design, the outdoor kitchen should be designed according to your heart’s desires. 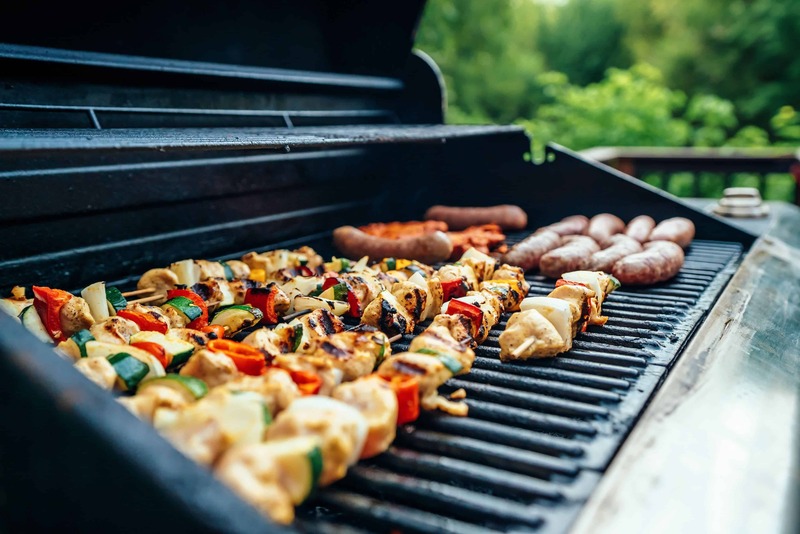 Of course, there are other factors to consider such as finances and space, but if you really want to design a good outdoor kitchen, then follow your heart. With this kind of set up, you can place the Smoker around the opening or at the center of the kitchen. 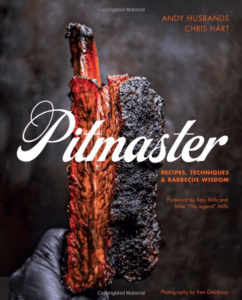 This will help you get lay on everyone at the table as well as having your eyes on the smoker. So, you will be able to join in the conversation without losing sight of the kitchen. Try the 26″ Barrel Charcoal Grill with Smoker on this one. This is the kind of set up that is used when you want to have friends over, and you want everyone to participate. With this one, everyone is free since they are no hiding place and people can see each other. The one on the ‘cue gets to show off his or her BBQ skills with everyone watching. You can try the Pitt’s & Spitt’s BBQ Combo Smoker Pit or the Compact Charcoal Smoker and Grill on this setup.